Anubis Dates: May 8 – 27, June 29 – July 13. Traits of Anubis people: Cunning, Intelligent, Sympathetic. Lucky Colors: Ocher for men, Raspberry for women. Associated Zodiac Sign: Leo ♌. 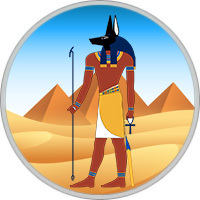 Anubis — the god of the kingdom of the dead, was responsible for the process of mummification and funeral, as well as for the stay of dead souls in the afterlife. He met souls at the entrance to his kingdom, judged her earthly sins and determined her place of residence or the measure of punishment. He was portrayed with the head of a wild dog or jackal, and his very name translates as "jackal". Ironically, Anubis rewarded his players with a sense of humor and the ability to find funny moments in the most difficult situations. True, their humor can be classed as "black", but you can not refuse them in wit and self-possession. These people are "owls", they like to stay up late and get up late. In addition, they are always single and prefer solitude. In the team, he is working poorly, on the contrary, remaining with problems one on one, they quickly find a solution. The children of Anubis god have a keen sense of justice. No one is able to hide the truth from them or to hamper their head. They always stand up for the weak and offended, they try to punish the guilty. Their judgment is always just. In the eyes of others, they look mysterious and mysterious, but they are valued for their loyalty, sincerity and sensitivity. These people are idealists, and are often severely disappointed in people. When this happens, they fall into depression and reflect on the vanity of the world and the futility of efforts. In a romantic relationship, they lack the flexibility, because they do not like to change their decisions and are very adamant. Burned several times, they are extremely cautious choose their partner, many times checking and rechecking it. They will only marry themselves when they are convinced that they have really found a soul mate and can live in complete peace and harmony. In difficult situations, the Anubis man always tries to find a way out without resorting to help from strangers. Due to their unique abilities, such individuals stand up for the weak and punish the guilty. The Anubis male likes to stay in the shade, not drawing attention to his modest person. For most people, they remain mysterious personalities who never reveal their secrets. Such a person is appreciated for his sincerity, honesty and loyalty. Women born under this sign, very impulsive person. They are used to being guided by their emotions, are prone to depression. Thanks to solitude you can deal with all your problems. Anubis woman is an excellent psychologist, she is always ready to talk and give the right advice. In its decisions, this person is completely unpredictable, this greatly complicates the love relationship. On the love front, her passions always boil, she strives to learn as best as possible the future of the chosen one, so she is in no hurry to make a decision.